Amazon India is selling IFB 6.5 kg Fully-Automatic Top Loading Washing Machine (TL-RDW 6.5kg Aqua, Ivory White) Rs.15290 only which is worth for Rs. 18499 at lowest and best price online.You can buy from flipkart also with Same price .You can follow the below steps to buy this product at their deal price.Keep Visiting dealsheaven.in for more Best offers ,hot online deals, promo code, coupons and discount . Main features: IFB washing machine comes with 8 different water level selection to ease your workload. This machine comes fitted with a large LED display which enhances the look of the machine. 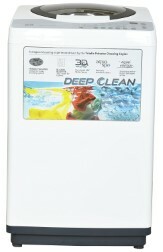 It provides auto bleach and softener dispenser. Lint filters and crescent moon drum improves the wash quality. Moreover, the machine uses Aqua energie feature which treats the hard water before using it. Smart sense technology, express wash and aqua conserve feature makes it an ideal purchase. Some other features which work towards high quality wash include aqua spa, triadic pulsator and 3D wash. IFB offers a warranty of two-year on this product. How to buy IFB 6.5 kg Fully-Automatic Top Loading Washing Machine (TL-RDW 6.5kg Aqua, Ivory White)?